Opinion polls, published by private-polling firm CNT/MDA on Saturday, project Bolsonaro will win 36.7 of the vote in the October 7 election. Fernando Haddad, the leftist Workers’ Party (PT) replacement candidate for jailed former president Luiz Inacio ‘Lula’ da Silva, is in second place with 24 percent of voter support. Lula topped opinion surveys gauging presidential candidates’ popularity levels prior to renouncing his candidacy last month after being barred from running by Brazil’s country’s top electoral court. If none of the 13 candidates competing for the presidency win more than 50 percent support, a runoff poll between the top two performers will take place on October 28. A head-to-head vote involving Bolsonaro, a self styled political outsider, and Haddad remains the most likely scenario, with CNT/MDA data projecting the far-right candidate would win such a poll. On Saturday, Bolsonaro tweeted that Brazilians no longer “had to choose between options that didn’t represent them”. “Now it is different! We love Brazil, we defend family and the innocence of children, we treat criminals as such and do not involve ourselves in corruption schemes,” he said. Haddad, meanwhile, claimed he was sure he could count on the Brazilian people to win, “vote by vote, until the last minute”. “I don’t believe in violence, in the dictatorship, in the lack of liberty. Let’s create opportunities, that’s how you do politics,” he tweeted. About 147 million people are expected to vote on Sunday, with participation compulsory for “literate” Brazilians aged 18 to 70. 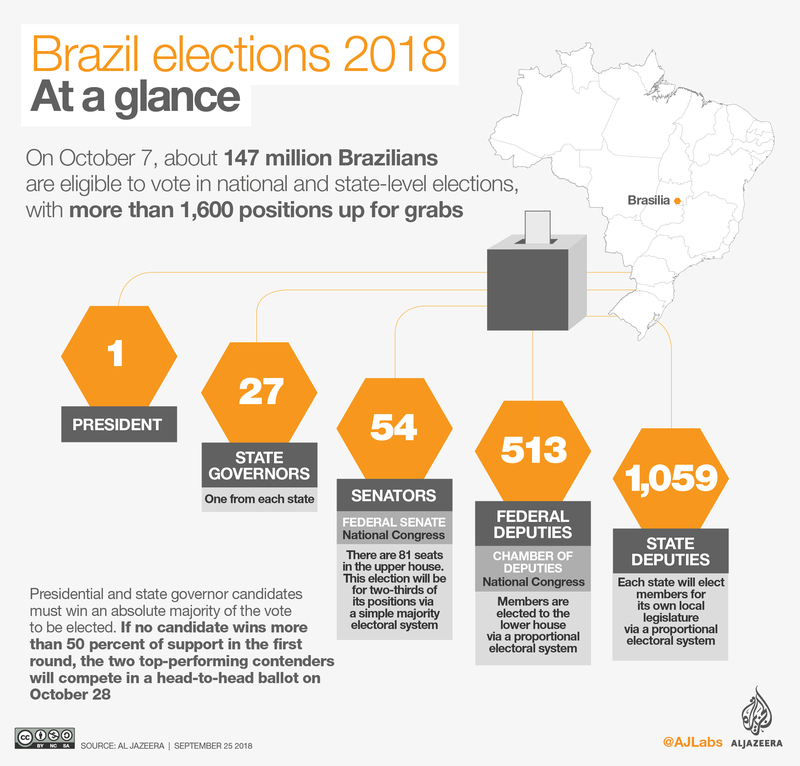 More than 1,650 positions are up for grabs, including most of the seats in Brazil’s congress and all 27 state governorships. Polling stations will be open from 8am local time (11:00 GMT) until 5pm local time (20:00 GMT) and results are expected to be announced close to midnight GMT. 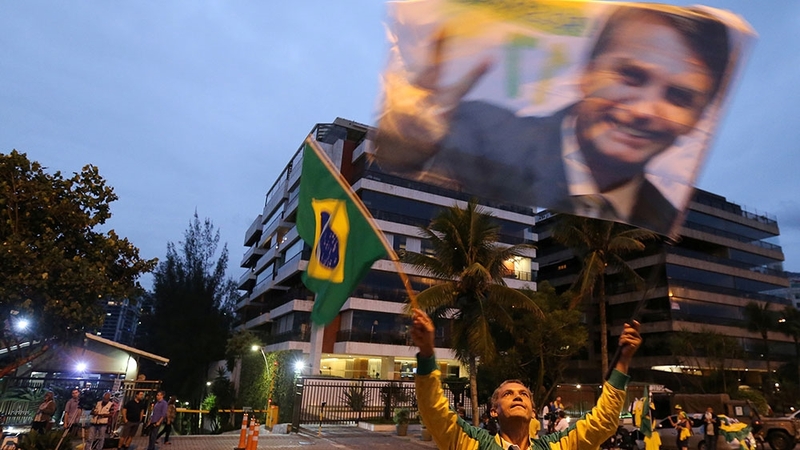 The election takes place amid a period of deep polarisation in Brazilian society, with the two frontrunner candidates also widely despised by many voters. 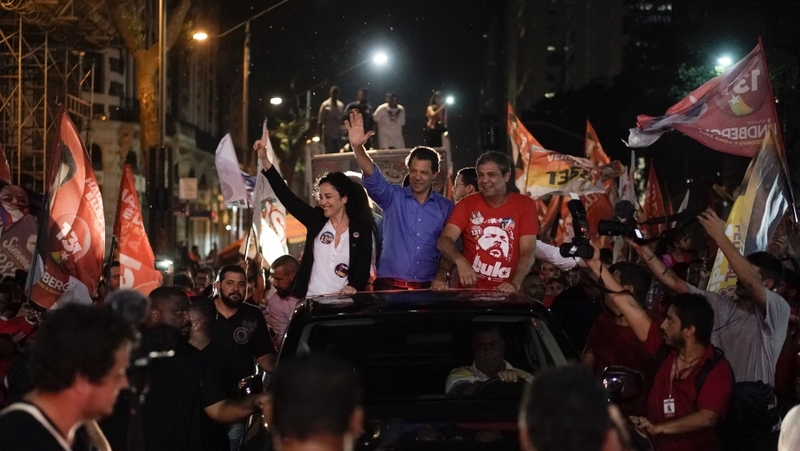 Ricardo Ribeiro, a political analyst at MCM Consultores, said there was a “lot of fear” among the electorate about a possible second-round showdown between Haddad and Bolsonaro. “Everyone can see the polarisation at large, which is heightened because on one side you have an extreme right-wing option. I don’t think the PT is an extremist party but it is a left-wing party. So you have this confrontation between two opposites,” Ribeiro said. “The discussion of whether or not democracy can be sustained is now relevant again,” he added. Bolsonaro, a former army captain, has repeatedly spoken out in favour of Brazil’s military government, which was in power from 1964-85. He has promised to fill his cabinet with military generals and his running mate, retired army general Hamilton Mourao, hinted last year that he would be in favour of a military takeover of government if corrupt officials were not dealt with by Brazil’s courts. 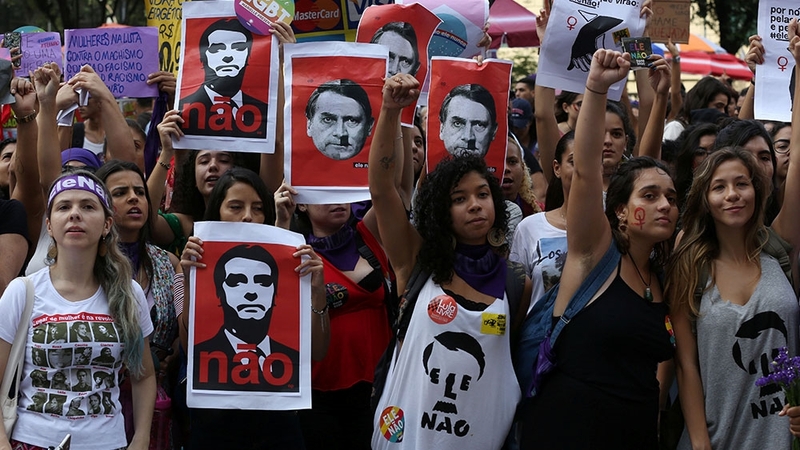 Bolsonaro has also made numerous overtly discriminatory comments about women, black and homosexual people. Last weekend, hundreds of thousands of Brazilians took to the streets to march against his candidacy as part of the social media driven and women-led #EleNao (#NotHim) movement. Thousands of Bolsonaro’s supporters also rallied throughout Brazil in response. Bolsonaro’s combative rhetoric and pledges to crack down on Brazil’s spiralling violent crime rates have found favour amid a backdrop of converging domestic crises. Many Brazilians are deeply frustrated with the country’s stuttering economy, public security crisis and a political class tarnished by several high-profile corruption scandals in recent years. Ricardo Luis Couto, a taxi driver in Rio de Janeiro where Bolsonaro has represented in Brazil’s congress since 1991, said Bolsonaro would help “change the country”. 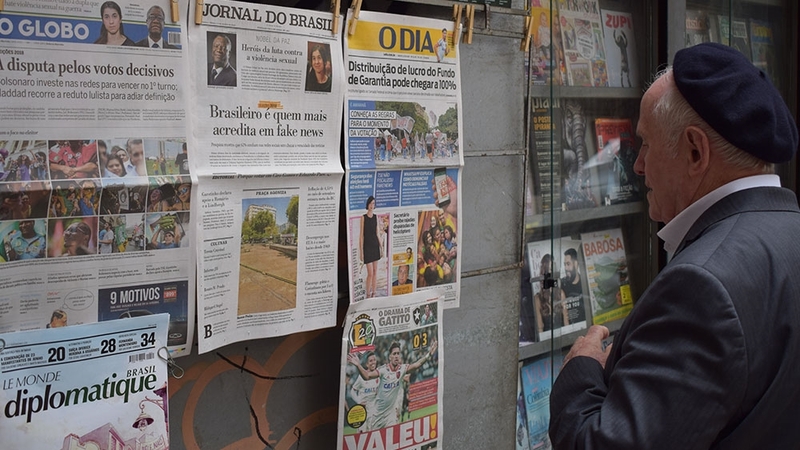 “The PT are a bunch of robbers, they stole a lot from Brazil, the crisis in Brazil only began after the PT got into office,” 46-year-old Couto told Al Jazeera, referencing the corruption scandals which have rocked the party in recent years. Malena Alberti, a former PT supporter, said she would also turn out for Bolsonaro. “Not only is he a military man, his goal is to preserve family values and to go against spreading communism in schools,” 30-year-old Alberti said. “Bolsonaro is the only one who has a clean slate … he’s going after the criminals, he doesn’t believe in human rights for them, only for good people … he’s in favour of progress and order for the country,” she added. Despite Bolsonaro’s rise in popularity ahead of Sunday’s vote, he also remains the candidate with the highest rate of rejection among the electorate. About 45 percent of voters say they would not support him under any circumstances, according to Datafolha. Haddad’s rejection rate stands at 40 percent, by comparison, a reflection of many voters’ distrust of the PT. A former mayor of Sao Paulo, Haddad has pledged to “make Brazil happy again” and revive the country’s ailing economy by cutting taxes on the poor and creating more employment in a bid to help the nearly 13 million Brazilians currently out of work into jobs. 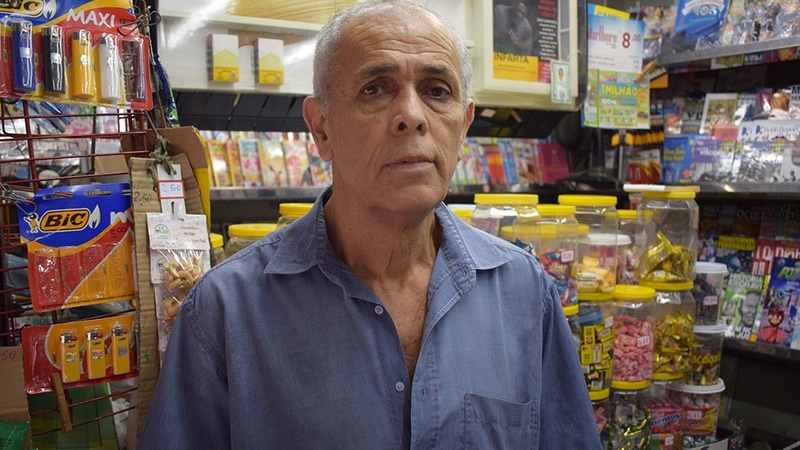 Pedro Gomes, 63-year-old newspaper stand owner, said he would be voting for Haddad on Sunday as he was “more qualified” than Bolsonaro for the presidency having served as a minister of education under Lula for seven years. 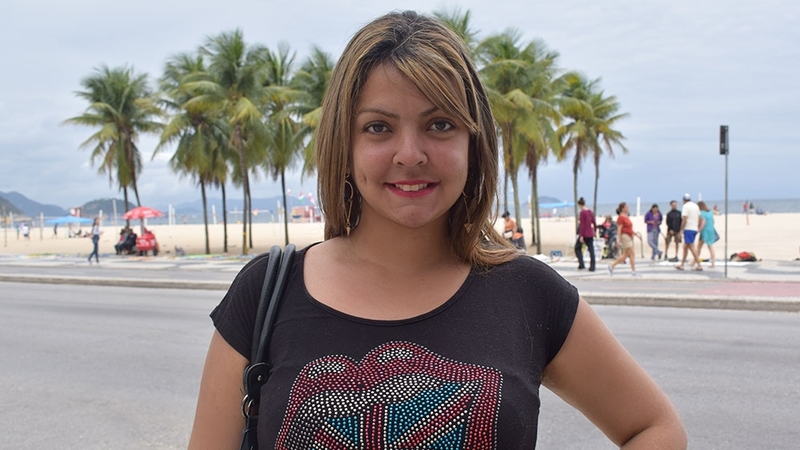 But for Sheila Xavier, 35, neither of the two frontrunners offer a solution to Brazil’s problems. “I don’t know who I’m going to vote for, but I know who I’m not going to vote for the PT or Bolsonaro,” Xavier, who is currently unemployed, said. “All the options right now for president say they are going to help provide better education and end violence but nothing actually happens,” she added. Previous articleHow did US Senators vote on Kavanaugh?